Home » The Staff » Nina P.
Nina provides great patient services and brings a positive, professional attitude to work every day. She is a phenomenal contribution to Willowbrook Texas State Optical and the patients. Making the dean’s list at school is Nina’s proudest accomplishment. Outside of the office, Nina enjoys reading a good book, trying out new makeup tutorials and playing or watching basketball. Her favorite team is the Rockets! Her most favored childhood memory is all the fun she had on Field Day in grade school. Nina is very knowledgeable, loves interacting with the patients, putting a smile on their faces and always comes in ready to assist. 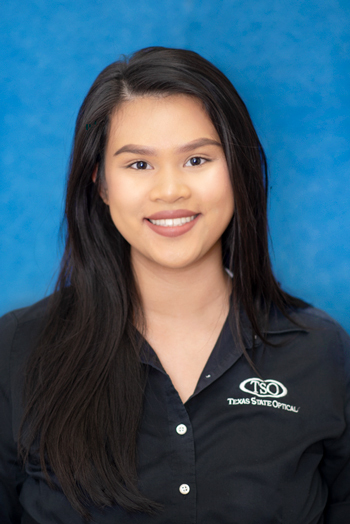 Nina looks forward to helping you with all of your vision care needs here at Willowbrook TSO!